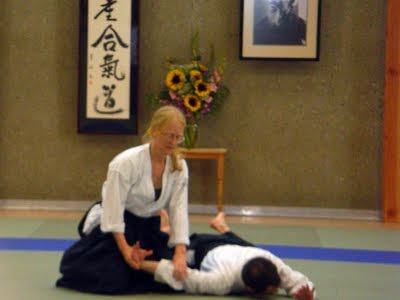 Suwari is an onerous practice for many people. In a couple of previous posts I have discussed this idea and tried to give some good pointers and excuses why we should make suwari a regular part of our practice. Today I think we came up with the best excuse for suwari yet. Do it simply because you don't want to do it. If your spirit rebels against the idea and you find yourself trying to make excuses to rationalize your way out of it, go ahead and do it. Immediately. I liken it to a sort of a mortification of the lazy part of yourself that avoids unpleasant practices. As we were discussing this idea today, a very wise black belt offered his own version of the same idea, "It's not just suwariwaza. Hell, I don't like exercise of any kind. I'd rather spend my life sitting around eating spaghetti and drinking red wine. But I can't do that so here I am at aikido practice!"